Lavender is one of those deliciously cosy scents that instantly calms you down and makes everything seem a lot more relaxed; I find it quite a nostalgic scent as well in that it can smell a little vintage but the right products have the perfect balance to keep things smelling fresh. All my lavender favourites are bath related, which I guess goes hand in hand with my theory of the scent being such a calming one. An old favourite is the LUSH French Kiss bubble bar, which has a combination of rosemary and lavender and it makes the perfect bath treat for a Sunday afternoon. I’m feeling a little sleepy even typing this, but it makes my whole flat smell delicious and leaves the bath with purple bubbles so it’s a winner for me. The perfect partner in crime is the English Lavender soap from The English Soap Company; it’s made from shea butter so it doesn’t leave my skin dry and the scent lingers beautifully on the skin. I don’t tend to use bars of soaps too often so this is a real treat (and the wrapping is beyond dreamy). 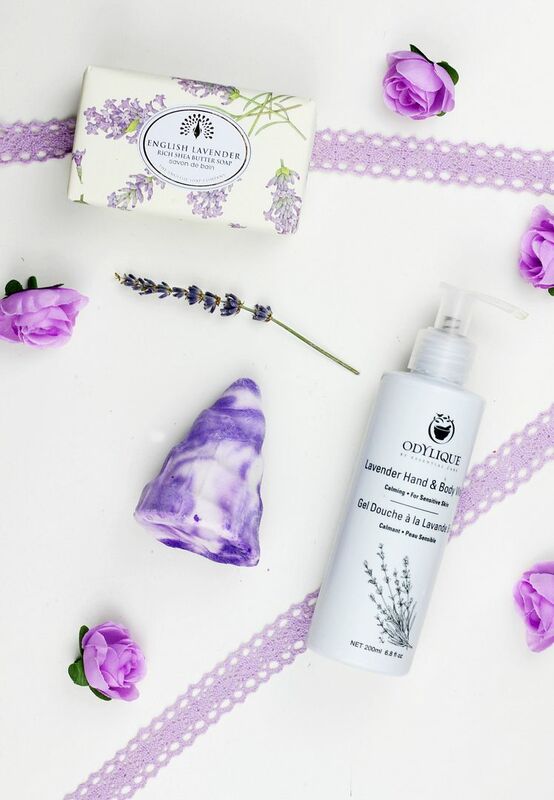 By my sink is the Odylique Lavender hand + body wash, which is the best hand wash I’ve tried for not leaving your hands feeling dry and sore. Odylique is a brand well worth checking out as their products are cruelty-free, and really lovely to use.